At the minute I am working on a project, using the latest version of Simutrans Extended and pak.128 Britain, to recreate as accurately as possible the British rail network as it was in 1975. Now, if anybody has any information - track plans, timetables etc - that could be utilized then that would be most appreciated. Screenshots will be coming soon, I promise. 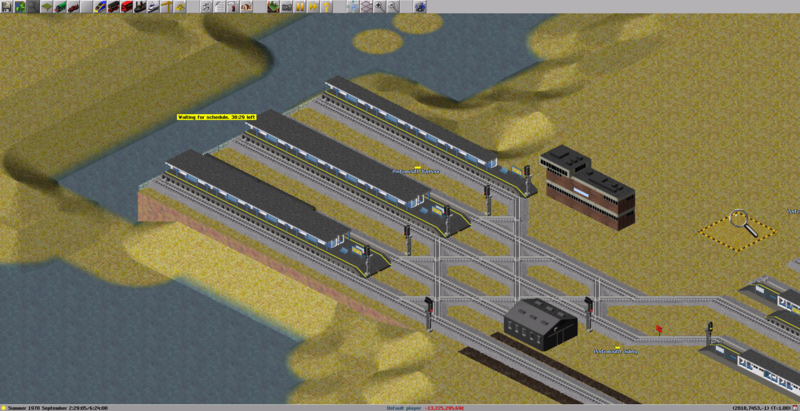 Here's a screenshot of Waterloo station and the surrounding area. Note that some of the platforms are underground for space reasons. Portsmouth Harbour. A fast service to Waterloo is sat in Platform 4. Gamesave? And also, can you give me the hightmap that you used please. 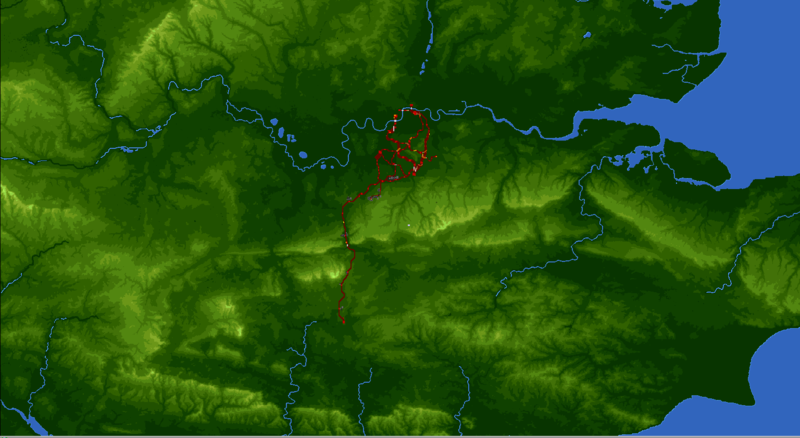 The heightmap is Carl's one he used for his GB map, and I'll upload a save when I've done all the lines out of London Waterloo. Okay, can you link it to me please? The line from Waterloo to Weymouth is complete. The lines from Basingstoke to Salisbury and Reading are complete. The line from Woking to Portsmouth Harbour is complete. The lines from Waterloo to Guildford via Epsom and Cobham are complete. The Dorking, Chessington South and Hampton Court lines are complete. Yes and it is very questionable becos there are certain lines and stations which are either misplaced or the line speed is higher than in real life but apart from that it looks promising. Read my PM. As far as I'm aware there isn't an option to set line speed limits in pak.128Britain and could you elaborate on what you mean by 'certain lines and stations which are either misplaced'. Also I haven't got a PM. 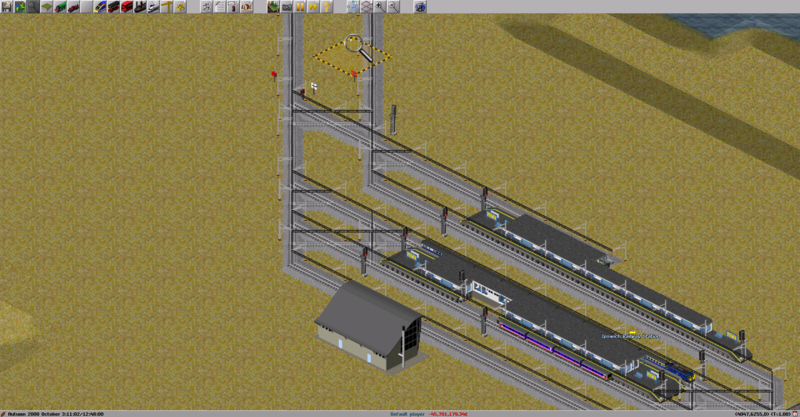 I mean that like some stations in the game are not place as they are irl and also there are different tracks to represent different speed limits. I mainly used Carl's GB map as a reference point for lines and stations and by, 'there are different tracks to represent different speed limits' do you mean that the slow lines should have a lower speed limit than the fast lines? If you mean by the speed limit on the track, I used the highest track level so I don't have to faff around with it later when stuff like the 442's and whatnot get introduced. Are you also going to ask why certain tracks/stations are not there/aren't electrified/don't exist? Great idea for a project! After 16 months since there was last an update to this, I've decided to finally revisit this. However, I've opted to change my intended goals with this map. 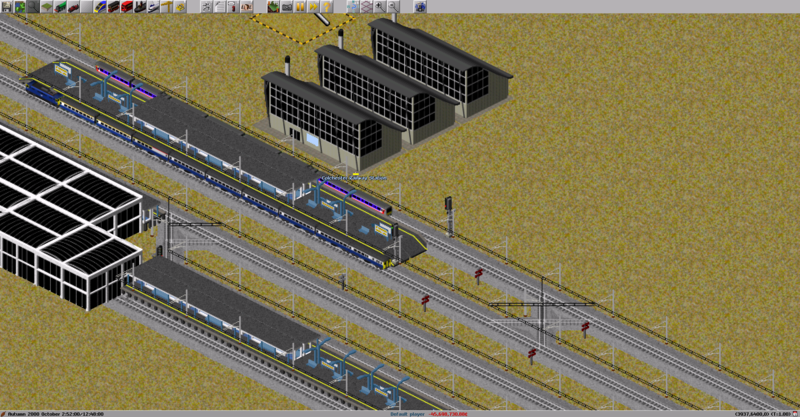 Due to the recent emergence of a fairly extensive (and highly excellent, I must say) timetable archive of the post-privatisation period, with plenty of timetables going back to the early 2000s, over on the DPSimulation website have convinced me to restart this map from scratch, this time building the UK rail network in the early 2000s, with somewhat accurate timetabling to go with it. Providing I ever actually finish this project (or even make some decent progress on it), it won't be completely accurate, as there are gaps within the archives at DPSimulation (though they may expand the archives in future), as well as general Simutrans 'quirks'. I chose to restart this map from scratch, as there were several issues with the previous map, and that, combined with my improved experience and understanding of Simutrans Extended, made it more worthwhile, in my mind, to restart this from scratch. From London Bridge, there is a train every 20 minutes to Beckenham Junction via Tulse Hill and Crystal Palace, and a half-hourly service to London Victoria via Crystal Palace. And from London Victoria, there is an hourly service to Epsom Downs, and a half-hourly service to Dorking, which every hour extends to Horsham. A bit basic, but it will expand eventually. Also, if anyone has any other timetables to contribute, then that would be greatly appreciated. Something I noticed recently is that South Central services from Tattenham Corner are actually timetabled to terminate at London Charing Cross! (this is off-peak hours, as well) Surprises do get thrown up, which I would never have known had there been timetables covering the period. After over a month of nothing, I've got some further updates. 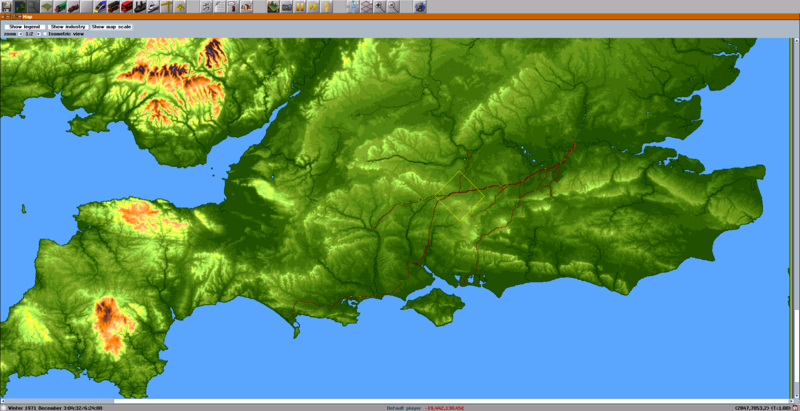 I've gone down to Brighton, with the Gatwick and Connex Expresses running, and have built the West Coastway to West Worthing. 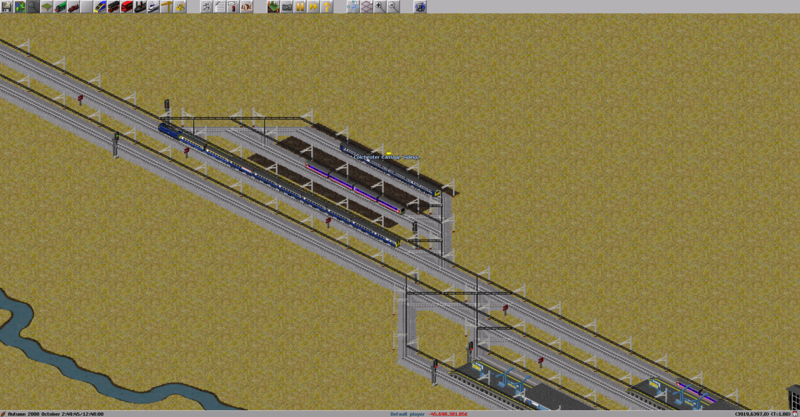 I had actually built the whole line to Portsmouth, but when saving the game I accidentally pressed "Load" instead. Oh dear. 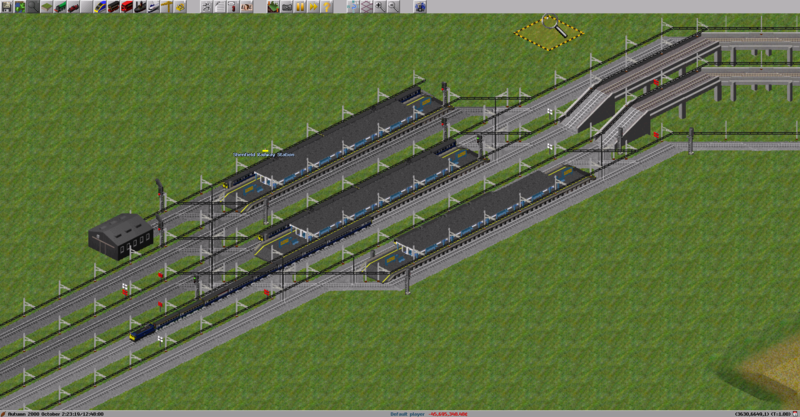 Anyways, I opted to start building the lines out of Liverpool Street instead. 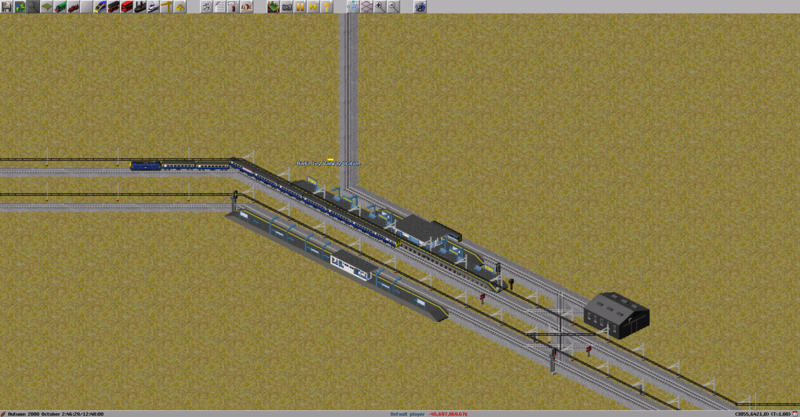 I've currently managed to build the West Anglia Main Line as far as Stansted Airport, as well as the Chingford, Enfield, and Hertford East branch lines, all running with services. I also have the Great Eastern Main Line built as far as Manningtree, with the Southend, Southminster, Braintree and Sudbury branch lines built and all receiving services. I will start getting the Clacton, Walton, and Harwich branches up and running soon, as well as the line to Ipswich, and, if possible, go all the way to Norwich. 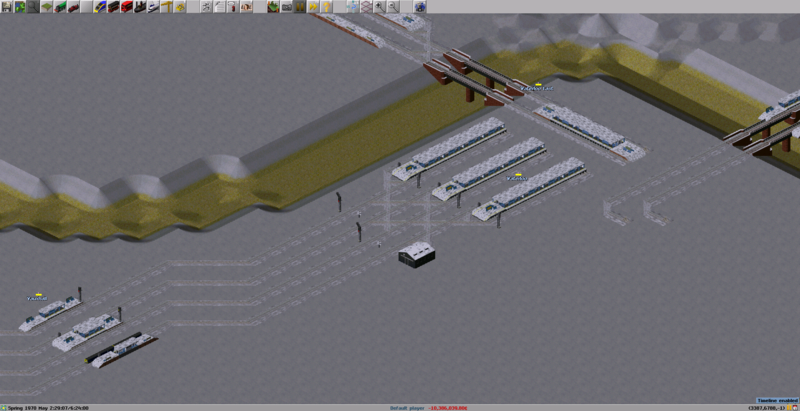 Afterwards, I will probably get the lines out of Fenchurch Street built, and after that, who knows what might happen. We shall see. Running fast through Shenfield, where the First Great Eastern "Metro" services over the slow lines from Liverpool Street terminate, and the lines to Southend Victoria and Southminster diverge. A single FGE operated Class 321 is stopped on Platform 2, with the 09:52 service from Ipswich to London Liverpool Street, and 2 8 car Class 315 sets are sat waiting to go back to London in Platforms 4 and 6. Passing through Marks Tey, where the FGE-operated Sudbury line meets the GEML. A single car Class 153, on loan from Anglia, is sat in Platform 3 waiting to head off to Sudbury on the 11:01 service. Approaching Colchester, the Carriage Sidings host 2 FGE units - a Class 321 and a slam door Class 312. Arriving at Colchester, an 8 coach Class 321 next to our train is operating the 09:38 FGE service to Colchester Town. At our next stop of Ipswich, a 4 car 321 is sat in Platform 4 waiting to head back to London. You can change here for services to Cambridge, Peterborough, Felixstowe and Lowestoft.. This is the northern boundary of First Great Eastern-operated services. We will now go non-stop to Norwich. We have now arrived at Norwich, our terminus, at 11:40. We can change here for services to Sheringham and Great Yarmouth. This is a neat idea and is looking good! Will you build up the cities like Carl has done? Perhaps. 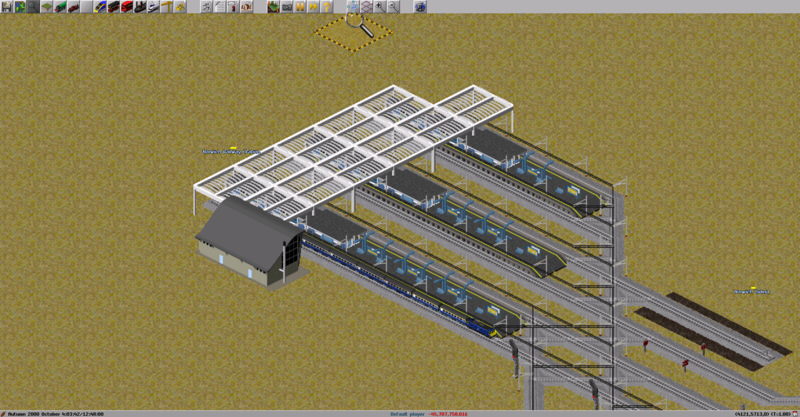 I want to get the network built up first, and for the time being, I will put a placeholder town near each station to generate some passenger traffic. Does anyone following this remember my fictional UK/GB/BR map? I think I still have a copy of at least one of your old maps on my computer. Okay. But I just wanted to ask that because my version of the map has been through a overhaul in every aspect and I was tempted to post a photo of an area of overhaul. But, in the end I never wanted to incase it took this topic off-topic. Where can I get that map? I'd like to play a game in it. Which map are you referring to? Heightmap, the most realistic one. It is the same map that Carl Baker used for his Great Britain simulation. You can get it here.